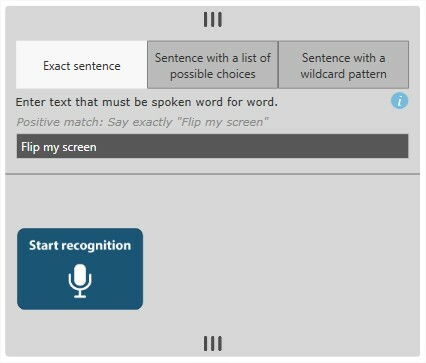 The Speech Recognition interface asset uses the Microsoft Speech Platform to capture the spoken word. With it you can gather information (like a visitor's name) or transform voices into a trigger of one or more actions to control your Intuiface experience. 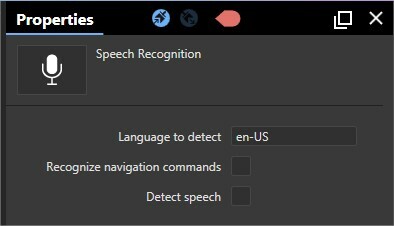 Speech Recognition is only available on Windows PCs. Speech Recognition cannot be trained to recognize - or reject - specific voices. It accepts all voices equally. 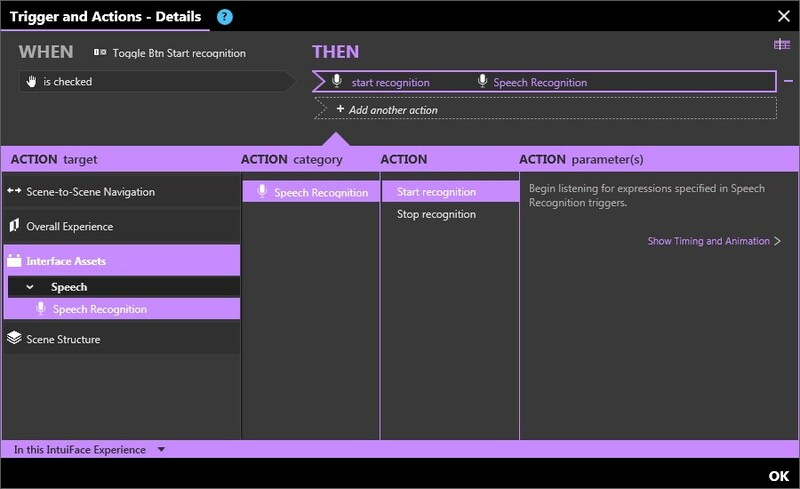 This interface asset (IA) works with all of the languages supported by the Microsoft Speech Platform SDK 11. There are currently 26 languages on the list. An exact sentence which has to be spoken word for word. For example: Play introduction video. A sentence with a list of possible choices. Use brackets to define multiple options, each option surrounded by double quotes and separated by a comma. A sentence with a wildcard. Use an asterisk to represent any one or more words. Add the Speech Recognition IA to your experience in Composer and then drag-and-drop it into the active scene. The following default template will be created, enabling you to test all three patterns. Language to detect: Specify the language code to use in your experience. See above. 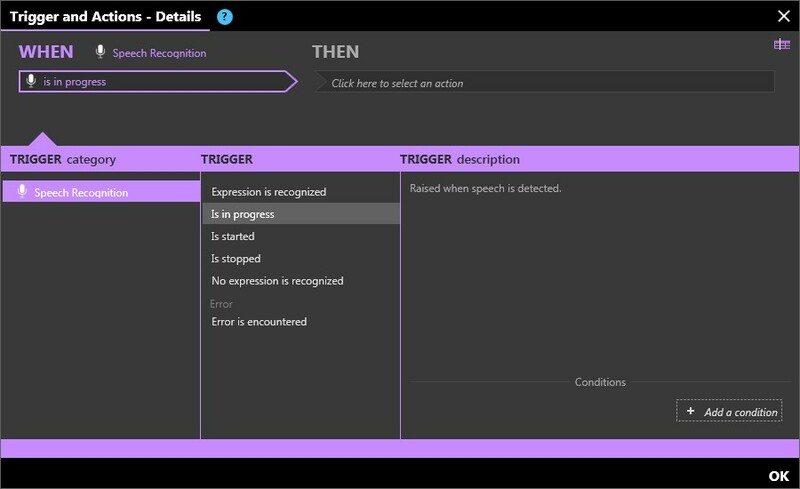 Detect speech: Has a value of 'true' if the Speech Recognition IA is actively listening for expressions. The following properties are read-only and thus only accessible via binding. Encountered an error: True / False value specifying whether the Speech Recognition IA encountered an error. Error message: The description of the error. For troubleshooting, keep in mind that the typical causes are a missing language package or microphone issues. Expression: the complete recognized expression. Recognition confidence: a percentage between 0 and 1. Variable part: If the trigger expression included a choice or wildcard pattern, this parameter will contain the recognized variable part. Detected speech: The speech currently recognized. Is started: Raised when the "Start recognition" action is called. Is stopped: Raised when the "Stop recognition" action is called. Error Message: the description of the error. Start recognition: Begin listening for expressions specified by all "Expression is recognized" triggers. Stop recognition: Stop listening for expressions. You can download a sample illustrating the Speech Recognition Interface Asset in action from our Marketplace.